Magnolias are among the most elegant of any of the trees, shrubs, or other plants used for landscaping purposes. Displaying lustrous, dark green leaves and large fragrant blossoms, the magnolias lend a dramatic flair to your garden. The magnolia family (Magnoliaceae) contains about 100 species of trees and tree-like shrubs; these are found primarily in the southern and eastern parts of the United States, and in parts of eastern Asia. Let’s look first at one of the most dominant and impressive trees in the landscape of the southeastern and gulf areas of the U.S., the Southern Magnolia tree. Even its scientific name (Magnolia grandiflora), sounds elegant. The tree, which can grow in excess of 75 feet in height, has a somewhat pyramidal or round-shaped crown. As the tree grows and ages, it takes on a singular and massive appearance, with the spreading habit of its branches and its large trunk, whose gray-brown bark becomes scaly through the years. The flowers of the Southern Magnolia are quite fragrant, with an almost lemony scent; and rather large (sometimes 6-10 inches in diameter), hence the name “grandiflora.” The blooming period of the tree is quite long, usually throughout the months of May and June and sometimes longer. The petals of the blooms are white and have an almost waxy glossiness to them. The huge and fragrant magnolia blossoms can be enjoyed indoors by cutting off a single bloom and displaying it in a shallow bowl of water as a centerpiece on the table. If you choose to add Magnolia grandiflora to your garden, be sure you give it plenty of room to grow and spread laterally. It most certainly will do this, and one of the worst things you can do to the tree is to prune it drastically in order to make it fit into its space. The Southern Magnolia does not respond well to pruning and its dramatic and grand appearance can be ruined by heavy use of the pruning saw. Part of the growth habit of the tree is to spread and maintain branches low on the main stem and close to the ground throughout its life. You might want to cut off just the very lowest of these branches while the tree is still young in order to be able to get in under the tree as it grows. This will allow you to clean up the fallen leaves and seedpods as necessary. And speaking of leaves and seedpods, let’s address this issue now, as this is about the only ongoing maintenance concern you will face with the noble magnolia tree. 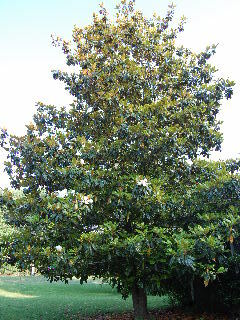 The leaves of the Southern Magnolia are evergreen. However, the tree does push off the old leaves as it grows new ones. These leaves, which are a dark, lustrous green on top and brown and somewhat hairy on the underside, are thick and leathery tough. You can, with a lot of work and patience, mulch the leaves up with your lawnmower if you pass over them quite a few times. However, their “wooly” nature generates a lot of dust as you chop them (be sure to wear a dust mask), and their toughness can be exasperating, so be prepared to take some time with this chore. Also the seedpods, which are about 4 inches long, are tough and often plentiful; these need to be raked up and tossed onto the compost heap or removed to some other place on your grounds if you don’t want them to accumulate under your tree. Other than dealing with the leaves and seedpods, however, the Southern Magnolia requires little maintenance and rewards you with a grand show throughout the year. A couple of other magnolia species to mention are the Star Magnolia (Magnolia stellata) and the Saucer Magnolia (Magnolia soulangeana), which are both good landscaping plants to consider working into your garden. These are actually dense shrubs or small trees (usually reaching heights of less than 20 feet), which are Asiatic varieties of magnolias, grown for ornamental purposes. They are deciduous in nature, and produce a great show of blossoms in the early spring before the leaves appear on the trees. 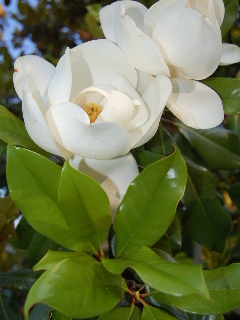 Look for the magnolias at your garden center, and add one or more of them into your landscape for a touch of grandeur.